Eighteen years ago, on October 1, 2000, Distributed Proofreaders volunteers began “preserving history one page at a time” by preparing public-domain e-books for Project Gutenberg. Since then, DP has contributed over 36,000 unique titles. Here’s a look back at some of DP’s accomplishments since our last retrospective. 33,000 titles. In November 2016, Distributed Proofreaders posted its 33,000th unique title to Project Gutenberg, A Flower Wedding, by the great children’s book illustrator Walter Crane. You can read all about it in this celebratory post. 34,000 titles. Our 34,000th title was, appropriately, A Manual of the Art of Bookbinding, and was posted in July 2017. The DP blog post on this milestone is here. 35,000 titles. DP contributed its 35,000th title, Shores of the Polar Sea, in January 2018. This beautifully illustrated account of a 19th-Century expedition to the North Pole is celebrated in this blog post. 36,000 titles. Just last month, DP celebrated 36,000 titles with the May 1882 issue of The American Missionary. You can find out more about this historic periodical — of which DP has posted over 125 issues, with more to come — here. Motor Matt. DP posted the last of 32 issues of this popular dime novel series in November 2016. Read all about it in this blog post. The History and Romance of Crime. In February 2017, we posted the 12th and final volume, Oriental Prisons, in this series of sensational accounts of crime and punishment around the world by a 19th-Century British prison administrator. The Jesuit Relations and Allied Documents. This is an important series of reports, in French, Latin, and Italian, with English translations, from Jesuit missionaries in the territory that became Canada. We celebrated the posting of eight volumes of these reports in a blog post in both English and French commemorating the 150th anniversary of Canadian confederation on July 1, 2017. The Gallery of Portraits: with Memoirs. In November 2017, DP posted the seventh and final volume of this important set of books, which was produced under the superintendence of the Society for the Diffusion of Useful Knowledge, a 19th-Century organization devoted to providing resources for self-education. Songs of the West. We posted this important 19th-Century collection of folk songs from Cornwall and Devon — with audio files so you can hear the music — in February 2018. Read all about it here. We updated our operating system to Ubuntu 16.04 and migrated to a new server and hosting facility. The OS update made possible some important upgrades to our forum and wiki software. We also made important updates to our site coding and some of our page designs to enhance consistency, usability, accessibility, security, and future support. We updated our official documentation and placed it in our wiki to improve our members’ access to it. The entire DP site is now available in French. Distributed Proofreaders is a close-knit community, and we all mourned when we lost three well-loved members during the past two years. Pucon, a retired geologist, was a prolific proofreader who completed over 27,000 pages in his three and a half years at DP. Long Green, whose friends knew her as Mama Beth, was an active proofreader and formatter who also post-processed a number of projects, some of them quite challenging. Her final project is celebrated in this memorial. Miller, known to her friends as Emmy, performed numerous roles at DP. As a project manager, she contributed 321 books, which she also post-processed, and she post-processed over 700 books contributed by others. Her legacy is celebrated here. Distributed Proofreaders is collaborating with Harvard University and the Smithsonian Institute in Project PHaEDRA. This project involves transcribing original notebooks created during the 19th and early 20th Centuries by researchers at the Harvard College Observatory, including early female astronomers and the famous Harvard Computers. Our General Manager, Linda Hamilton, recently participated in a video interview about our participation in Project PHaEDRA. Many thanks to all the Distributed Proofreaders volunteers, past and present, who made this 18th anniversary possible! This post was contributed by Linda Cantoni, a DP volunteer. This is the sixth and last in a series of posts celebrating Distributed Proofreaders’ 15th Anniversary. 26000 Comic Insects, by F.A.S. Reid (1872), was posted October 1, 2013, as the 26,000th book. 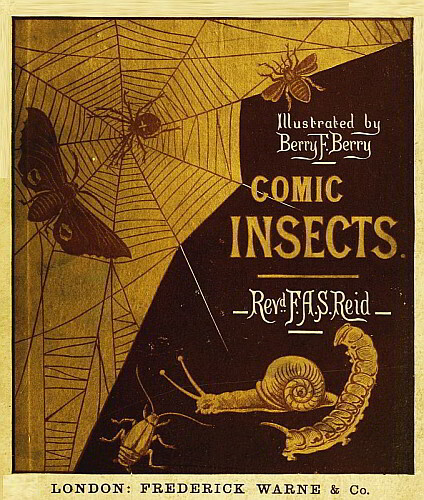 This is a collection of amusing poems about insects and features delightful illustrations by Berry F. Berry. The Hot off the Press blog post for this milestone, which coincided with DP’s 13th anniversary, can be found here. 27000 Number 27,000 was the 13-volume Storia della decadenza e rovina dell’impero romano (The History of the Decline and Fall of the Roman Empire), an Italian translation of the classic work by British historian Edward Gibbon, posted March 28, 2014. It was originally published in London in separate volumes between 1776 and 1789. Italian author Davide Bertolotti translated it to Italian, and his version was published in Milan between 1820 and 1824. See the Hot off the Press blog post here. 28000 For a change of pace, The Mystery of Choice, by Robert W. Chambers (1897), was posted as the 28,000th selection on August 16, 2014. This book is a collection of short, related stories with topics ranging from a murder mystery, to the ghost of a dark priest, to the search for dinosaurs — in short, something for everyone. The Hot off the Press blog post about it is here. 29000 Histoire de France (History of France), by Jules Michelet (1867), was posted on January 14, 2015, making it the 29,000th contribution from DP to Project Gutenberg. This 19-volume masterpiece took Michelet 30 years to complete, and it took DP over nine years to transform the complete set into a high-quality set of e-books — a tremendous accomplishment all around. Here is the Hot off the Press blog post celebrating this milestone. 30000 As you may expect, the 30,000th title was represented not by a single book, but by 30, posted on July 7, 2015. They represent the vast scope of DP volunteers’ work, with books on science, technology, medicine, poetry, archaeology, folklore, literature, drama, history, autobiography, political science, and fiction, both general and juvenile. They include works in English, French, German, Spanish, and Italian. Each of the thirty titles represents countless hours of work by DP’s many volunteers, who performed myriad tasks such as preparing the page scans, setting up the projects, carefully proofing and formatting the texts page-by-page to ensure their high quality, post-processing, smooth-reading, and verifying them — not to mention those who make all that work possible by maintaining and improving DP’s online systems, mentoring, and performing a host of other essential tasks. This Hot off the Press blog post gives the list of books, with links, for this milestone. PG’s 50,000th title DP had the honor of contributing Project Gutenberg’s 50,000th title just last month, on September 17, 2015. This was, appropriately, John Gutenberg, First Master Printer, His Acts, and most remarkable Discourses, and his Death, by Franz von Dingelstedt. The Hot off the Press blog post celebrating this achievement is here. As part of DP’s 15th Anniversary celebration, a DP volunteer recorded an audiobook of this title for Librivox. Thanks and congratulations to the entire Distributed Proofreaders community, whose dedication to “preserving history one page at a time” has made this 15th Anniversary celebration possible. This is the fifth in a series of posts celebrating Distributed Proofreaders’ 15th Anniversary. 22000 We go to January 2, 2012 — and 1901 — for the 22,000th offering, The Nibelungenlied, the great medieval German epic poem, translated into English by William Nanson Lettsom. It tells the tale of the hero Siegfried, who slays a dragon, gains a treasure, fights a number of battles, and wins a fair lady — thereby setting into motion a tangled and tragic plot that is famously the basis for Richard Wagner’s great opera cycle, The Ring of the Nibelung. 23000 June 5, 2012, gave us Crusoe’s Island: A Ramble in the Footsteps of Alexander Selkirk, by John Ross Browne, the 23,000th contribution. Published in 1864, this is an account of the Irish-born American author’s experiences in the Juan Fernández Islands, his stint as a government commissioner in California, and his life as an agent in the Nevada silver mines. The author’s sketches are included. 24000 French literature provided the 24,000th book, on October 31, 2012, Cours familier de littérature (Familiar Literature Courses, vol. 14, 1862), by M.A. de Lamartine. Alphonse Marie Louis de Prat de Lamartine, Chevalier de Pratz, was a French writer, poet, and politician who was instrumental in the foundation of the French Second Republic. He ended his life in poverty, publishing monthly installments of the Cours familier de littérature to support himself. You can find the celebratory blog post for this milestone here. 25000 DP’s 25,000th book was, appropriately for the “silver milestone,” The Art and Practice of Silver Printing, by pioneering photographers H.P. Robinson and Captain Abney (1881), which was posted April 10, 2013. The authors noted, “The one defect of silver printing is the possibility of its results fading; but surely it is better to be beautiful, if fading, than permanent and ugly. It is better to be charmed with a beautiful thing for a few years, than be bored by an ugly one for ever.” You can read more about this book on Hot off the Press here. Next: The celebration continues with milestones 26000 to 30000. This is the fourth in a series of posts celebrating Distributed Proofreaders’ 15th Anniversary. 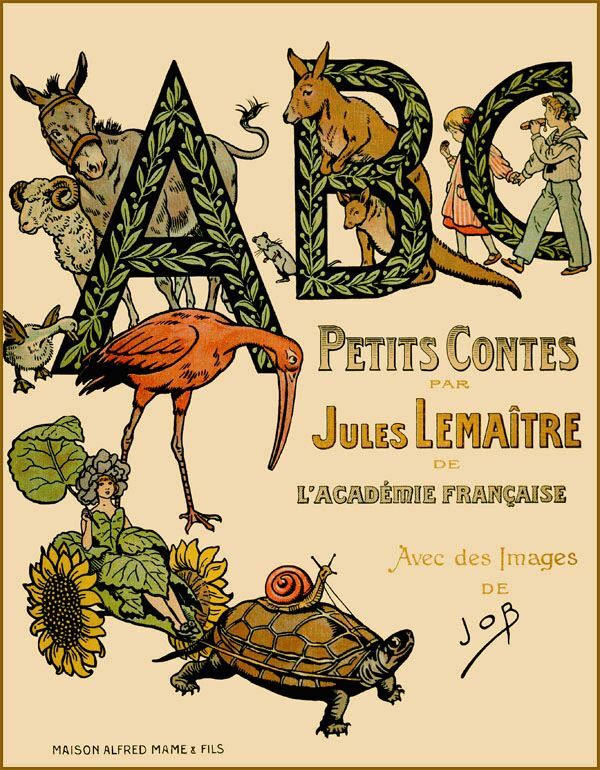 16000 October 1, 2009, brought to Project Gutenberg ABC: Petits Contes (ABC: Short Stories), by Jules Lemaître (1919, French). This is a beautifully illustrated children’s book. Even if you can’t recognize a single French word, this book is worth downloading for the striking color illustrations by “Job” (Jacques Onfroy de Bréville). 10th Anniversary On October 1, 2010, DP kicked off a 10-day celebration of its 10th anniversary. This blog was inaugurated on that date with A Decade of Dedication, and continued each day until October 10 celebrating DP-produced books and DP volunteer stories: The Journal of Sir Walter Scott, An Introduction to Astronomy, “Turn around when possible,” Kipling’s Just So Stories, Rimsky-Korsakov’s Principles of Orchestration, the Encyclopedia of Needlework, In Pursuit of Poetry, Come out of the Kitchen, and, finally, a slice of DP history from its former General Manager, Garage Musings. 19000 The 19,000th title was a Dutch offering, Vanden Vos Reinaerde, Uitgegeven en Toegelicht, edited by W.J.A. Jonckbloet (1856), posted November 9, 2010. This is a critical edition of the medieval fables about the clever Reynard the Fox, which were satirical commentaries on human society disguised as animal tales. 20000 Then, on April 7, 2011, DP celebrated its 20,000th title with multiple books in multiple languages: English; Italian, including Neapolitan and Sicilian dialects; German, including Middle High German; Latin, including Latino sine flexione; Dutch; French; and Esperanto. You can find the full list, with links, in this celebratory blog post. Next: The celebration continues with milestones 21000 to 25000. This is the second in a series of posts celebrating Distributed Proofreaders’ 15th Anniversary. 6000 For its 6,000th title, DP submitted the two volumes of The Journal of Sir Walter Scott. This diary of the famed Scottish novelist runs from 1825 to 1832. Two days after he started the diary, Scott expressed concerns about the financial stability of his publisher, in which he was a significant investor. The following year, the publisher failed, leaving Scott with some £130,000 of debt (the equivalent of about £9.5 million today). Scott then spent the next seven years — the rest of his life — churning out more novels in his bestselling Waverley series, as well as other writings, to pay off this massive debt. You can find a blog review of it here. Opúsculos por Alexandre Herculano, tomo I (Pamphlets by Alexandre Herculano, vol. 1) (1873, Portuguese). The Portuguese novelist and historian Alexandre Herculano introduced the historical novel to Portugal. His pamphlets covered such diverse subjects as “Theatre, Ethics, and Censorship,” “The Economic System,” and more. Viage al Parnaso (Trip to Parnassus) by Miguel de Cervantes Saavedra (1784 edition, Spanish). This poem by the author of Don Quixote is a satire of early 17th-Century Spanish politics. Leabhráin an Irisleabhair-III (Booklet of the Journal-III) (1903, Irish). DP volunteers worked on this as a Special Day project for St. Patrick’s Day. It was published as part of a series of extracts from the main Journal of the Conradh na Gaeilge (The Gaelic League), and consists of short pieces designed for beginners in reading Irish. 8000 February 8, 2006, saw the 8,000th title from DP, The Suppression of the African Slave-Trade to the United States of America, 1638-1870, by W. E. B. Du Bois. 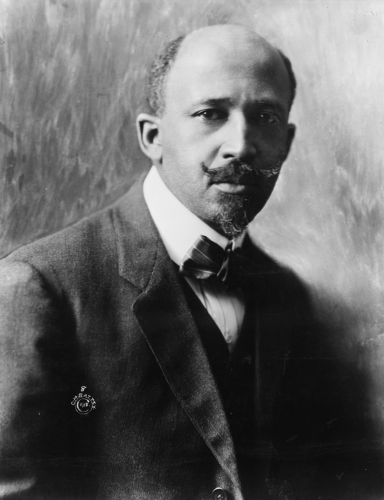 Du Bois was a leading African-American scholar and activist. This, his first book, published in 1896, was a revised version of his 1895 doctoral dissertation at Harvard University, where he was the first African-American student to earn a Ph.D. degree. Du Bois helped found the NAACP in 1909. 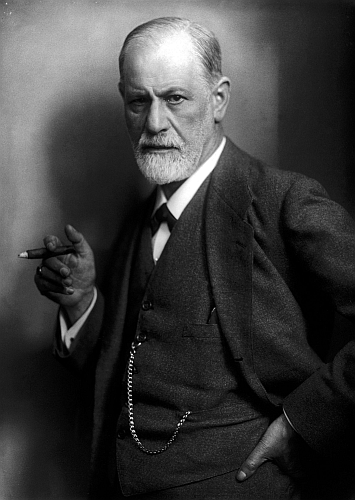 He published over one hundred articles and essays, and authored twenty-one books, including two novels. Kelly Miller’s History of the World War for Human Rights, by Kelly Miller. This 1919 treatise by a noted African-American mathematician and author “sets forth the black man’s part in the world’s war with the logical sequence of facts and the brilliant power of statement for which the author is famous,” according to the publisher’s introduction. It contains numerous historic photographs. Poems, by Christina G. Rossetti. British poet Christina Rossetti, sister of the equally famous Pre-Raphaelite poet and artist Dante Gabriel Rossetti, wrote children’s, devotional, and romantic poems. She is best known for “Goblin Market,” “Remember,” and the lyrics to the Christmas carol “In the Bleak Mid-Winter,” all of which appear in this 1906 collection. Hey Diddle Diddle and Baby Bunting, illustrated by Randolph Caldecott. This 1882 picture book of two nursery rhymes, illustrated by the famed British artist, is a lovely example of Caldecott’s work. The prestigious Caldecott Medal, awarded to the most distinguished American picture book for children, was named after him. Species Plantarum, Sections I-III: Monandria, Diandria and Triandria, by Carolus Linnaeus (Carl von Linné) (1753, Latin) – the first part of the great Swedish botanist’s groundbreaking treatise on plants. Agriculture for Beginners, by Charles William Burkett, Frank Lincoln Stevens, and Daniel Harvey Hill (1914) – a textbook on farming for the young. Le Marchand de Venise, by William Shakespeare (1862 edition, French) – The Merchant of Venice, translated into French by the historian and statesman François Guizot. The Shanty Book, Part I, Sailor Shanties, by Richard Runciman Terry (1921) – a collection of English sea shanties, with midi files you can listen to. The Annals of the Cakchiquels – an 1885 English translation of Guatemalan Mayan history and legends, set down in the Kaqchikel Mayan language by Francisco Hernández Arana Xajilá (fl. 1582). Encyclopedia of Needlework, by Thérèse de Dillmont – English edition of the 1886 French needlework bible, lavishly illustrated; reviewed by Hot off the Press here. R. Caldecott’s First Collection of Pictures and Songs, by Randolph Caldecott – with lovely pictures by a master of children’s-book illustration. Sylva, or, A Discourse of Forest-Trees (vol. I), by John Evelyn (1664) – the classic work on forestry. Punch, or the London Charivari, Volume 159, October 27, 1920 – an issue of the classic British humor magazine. Heimatlos, by Johanna Spyri (1890, German) – two illustrated stories for children. Heidi by Johanna Spyri – an English translation of the classic Swiss children’s novel, in an illustrated “gift edition” of 1919. Como eu atravessei Àfrica (v. II), by Alexandre Alberto da Rocha de Serpa Pinto (a.k.a. Serpa Pinto) (1881, Portuguese) – the Portuguese explorer’s account of his trek through Africa. Eighth Annual Report of the Bureau of Ethnology to the Secretary of the Smithsonian Institution, 1886-1887, ed. John Wesley Powell – an account of the progress of the Bureau of American Ethnology in its anthropological, archaeological, and linguistic studies of Native Americans. Slave Narratives: A Folk History of Slavery in the United States from Interviews with Former Slaves (vol. XIII, Oklahoma), by the Works Project Administration Federal Writers’ Project (1941) – first-person accounts of the lives of former slaves in the U.S., transcribed by DP volunteers from images of typewritten manuscripts. Next: The celebration continues with milestones 11,000 to 15,000. Fifteen years ago, on October 1, 2000, Distributed Proofreaders volunteers began “preserving history one page at a time” by preparing public-domain e-books for Project Gutenberg. Since then, DP has contributed over 30,000 unique titles. In honor of DP’s 15th Anniversary (and the 5th Anniversary of both DP Italy and Hot off the Press), here is the first of a series of posts recognizing DP’s first contribution to Project Gutenberg, and every 1,000th offering thereafter. 1 The first book that DP posted to Project Gutenberg was an English translation of The Iliad of Homer. This is believed to have occurred November 22, 2000 (record-keeping at both DP and PG was not as meticulous back then). The Iliad is a classic Greek poem set during the last few weeks of the ten-year Trojan War between the ancient city of Troy and a group of Greek states. The poem relates a fateful quarrel between the Greek commander-in-chief, Agamemnon, and one of his captains, Achilles. The putative author, Homer, is thought to have been born more than 100 years after the events in the poem. 1000 DP believes that its 1,000th book was Tales of St. Austin’s, by the great British humorist P.G. Wodehouse. This was posted to Project Gutenberg on February 19, 2003. It is a collection of amusing “school stories” plus a few essays, published in 1903, and was one of Wodehouse’s first published books. Wodehouse was one of the most widely read writer of humorous novels in the 20th century. He left a career in banking to become a successful author, lyricist and playwright. 2000 On September 3, 2003, just short of seven months later, Project Gutenberg posted the 2,000th book from DP. This was The Tragicall Historie of Hamlet, Prince of Denmarke: The First (‘Bad’) Quarto. Published in 1603, this edition of Shakespeare’s Hamlet was lost until discovered in 1823. It was first believed to be an earlier version of the play, then believed to be a pirated copy, possibly created by an actor who had played a minor part in the play and had reconstructed it from memory. 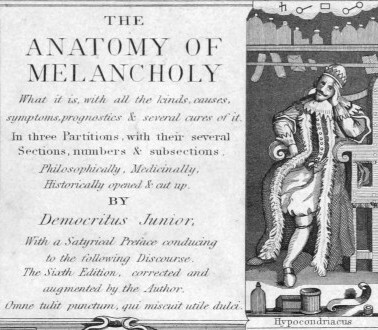 3000 Just three and a half months later, on January 14, 2004, DP posted the 3,000th book: Robert Burton‘s masterful study of depression, The Anatomy of Melancholy, first published in 1621. The Project Gutenberg version is based on a 19th Century edition, in which the introduction notes, “The work now restored to public notice has had an extraordinary fate. At the time of its original publication it obtained a great celebrity, which continued more than half a century. During that period few books were more read, or more deservedly applauded. It was the delight of the learned, the solace of the indolent, and the refuge of the uninformed.” The writer of that introduction could not have predicted that the book’s “extraordinary fate” would include being made available to all in cyberspace. 4000 On April 6, 2004, less than three months later, DP posted its 4,000th book. 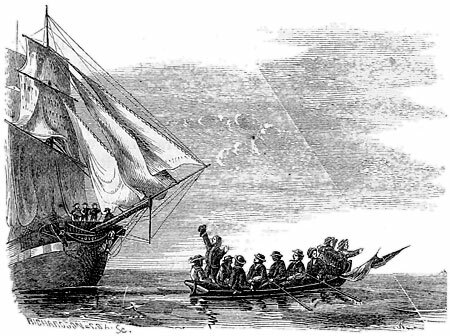 Aventures du Capitaine Hatteras (Adventures of Captain Hatteras), by Jules Verne (1864, French), demonstrates that DP has a long tradition of producing books in languages other than English. Verne’s adventure novel contains two parts: “Les Anglais au pôle Nord” (“The English at the North Pole”) and “Le Désert de glace” (“The Desert of Ice”). After a mutiny destroys their ship, Captain Hatteras and what is left of his crew spend the winter on an ice island, build a boat from a shipwreck, and travel to a volcano situated right on the Pole. Next: The celebration continues with milestones 6,000 to 10,000.